As of April 21st, if your site is not mobile-friendly, it just might not be viewed by mobile users. The latest Google algorithm update is all about mobile. Recognizing how important relevant and timely results are to the mobile user, Google has expanded its use of mobile friendliness as a rankings signal. The update will help users discover more mobile-friendly content in two ways: 1.) More mobile-friendly websites in search results and 2.) More relevant app content in search results. Projected to have a significant impact on mobile search results, the change will affect mobile searches in all languages, making it easier for users across the globe to get relevant, high-quality search results optimized for their devices. In addition, Google has introduced App Indexing, which allows it to use information from indexed apps as a factor in ranking for signed-in users who have the app installed. This allows Google to surface content from indexed apps more prominently in search. But why such an emphasis on mobile-optimized websites? If your site is not mobile-friendly, mobile users are forced to view a version with fonts, layouts and image dimensions created for the sizes of desktop and laptop computers. Users have to zoom in to read content, making it harder for them to find relevant information. Site menus and links are difficult to access and some site functionalities won't even work on a mobile browser. It makes sense that at this point, users typically get frustrated and exit the site altogether. The truth is that mobile viewing of a website created for a PC often leaves much to be desired. Mobile-friendly sites are built to be viewed on multiple devices, with content resized for smaller screen viewing, prominent menus for easier navigation, images that actually fit the screen, and applications that do indeed work. Taking into consideration the impact on user experience, it makes perfect sense that when it comes to mobile search, Google is now ranking mobile-friendly sites higher than others. If you are a business catering to a particular area, chances are you are trying to attract customers within it. And it should come as no surprise that on-the-go users are making quick decisions when it comes to the local businesses that should, well, get their business. According to a survey from the Pew Research Center, 74% of adult smartphone owners (ages 18 +) use their phone to get directions or other information based on their current location, and 30% of cellphone and smartphone users used their phone within the previous 30 days to decide whether to visit a business, such as a restaurant. A study from Google reported that when people use mobile search to help make a decision, they are 57% more likely to visit a store, 39% more likely to call a business, 51% more likely to make a purchase, and 30% more likely to visit a retailer website. Regarding the type of local information mobile users are searching for, 54% are looking for business hours, 53% directions to a local store, and 50% a local store address. Taking these numbers into consideration, you can see how important the mobile friendliness of your website is for attracting local customers. Often, your website can be the first interaction a potential customer has with your business, and if it's not a good one, he or she might not ever actually set foot inside of it. The latest update raises the stakes even higher. If your site isn't mobile-friendly now, users might not ever come across it on their devices in the first place. In short, not appearing within search results could cost you a potential customer or two. How are users viewing your website? Tablets, smartphones, eReaders and more - users have a variety of choices when it comes to surfing the Web. According to the Pew Research Center, 63% of cell phone owners now use their phone to go online and 34% of cell Internet users go online mostly using their phones, not some other device such as a desktop or laptop computer. In fact, users are choosing to use mobile devices even if they have a computer within close range. The Google study reports that 77% of mobile searches occur at home or work, with 81% of users attributing this to the speed and convenience of using their mobile device. So, even if you aren't a local business and your target audience isn't necessarily on-the-go, the mobile optimization of your website might be just as important. A quick look at your website analytics can reveal whether or not your Web audience consists of mobile searchers by detailing which devices are being used to view your website. If Web analytics reveal that a considerable number of users are viewing your website on a mobile device or tablet, then you know they are looking for your products and services. If analytics show that mobile users are coming to your site, but quickly exiting, not viewing multiple pages per session, or that sessions aren't even lasting very long - it might be time to go mobile-friendly. This indicates the audience is there, but your website just isn't yet. Take a thorough look at which channels are bringing traffic to your site. Organic traffic details the number of users coming to your site through a search engine. These users are specifically looking for products and services related to your business. Whether or not they see your site listed in the search results depends on Google's algorithm, which consists of 200 unique signals or “clues” that make it possible to guess what users might really be looking for. Now, one of those unique signals includes mobile friendliness. Google doesn't want to send searchers to a website they will have trouble viewing on their device, and we don't blame them. If one of the main sources of traffic to your site is organic search, you probably want to keep it that way, which means ensuring your site follows Google's webmaster guidelines and SEO best practices. In regard to attracting mobile users, your first goal is to get them to your site, the second is to keep them on it. Mobile optimization can allow you to do both. When it comes to the mobile optimization of your website, you might want to take a "better now than later" rather than "better late than never approach." Want to ensure your website is found and viewed by potential customers on the go? 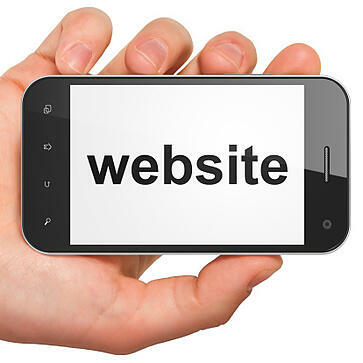 HexaGroup can optimize your website for mobile with Responsive Web Design.